Obama Thinks Solar Power Will Boost Kenya; Kenyans Aren't So Sure : Goats and Soda Are solar panels the best way to connect millions of Africans to electricity? That's the plan the president will tout on his visit to Kenya. Critics ask: What about tapping into power lines? 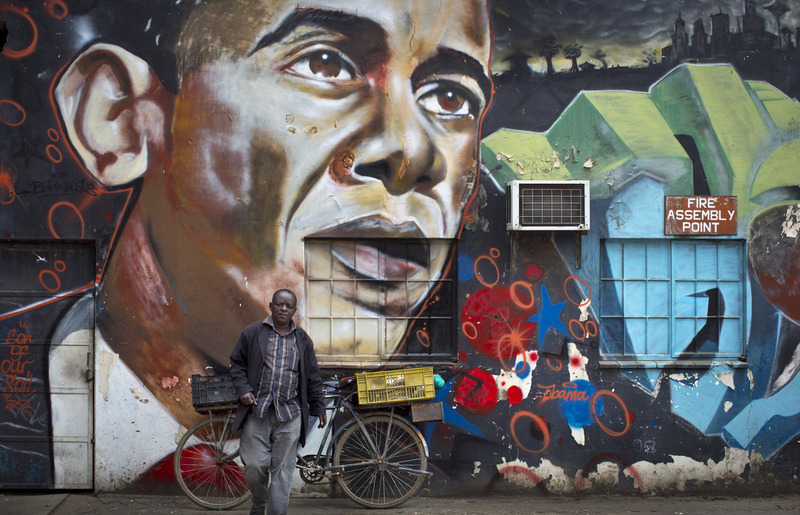 Kenyan graffiti artist Bankslave created a mural of Barack Obama. The president himself will visit Kenya on Friday. One of the president's agenda items is to promote solar power. When Jackline Mumbua decided to go solar, she knew the cost would be steep. The 35-year-old housewife in Machakos, Kenya, can barely cover the expenses of raising three school-age children on the little money her husband earns driving a motorcycle taxi. They have no savings. It took her family nearly two years to pay, in monthly installments, the $55 for a small rooftop solar panel. When it finally arrived last September, they hooked it up to four lightbulbs — one in each room, and a fourth as a security light over the front door. Her 8-year-old daughter was so excited that she ran and gathered all the neighbors. They sang and danced in the illuminated front yard. Mumbua felt overjoyed. Now she wouldn't have to worry about whether she had enough money for paraffin candles to avoid eating in darkness. Now she could think about taking a job during the day and saving her chores for night. Now they had a security light. Now her kids could finish their homework. That's where the solar Africa story usually ends. It's the kind of optimistic story that President Obama will tell when he visits Kenya on Friday. He'll be promoting his signature Power Africa initiative, and within that, a program called "Beyond the Grid," which leverages a billion dollars in private investment to market renewable energy products — and low-cost financing to pay for it — to rural Africans. But Jackline Mumbua's story didn't end there. The next day, after the lights went on, she woke up to all the things she could not do with her meager wattage. She can't power a refrigerator. She can't install a pump to run water. And yet the solution to all these needs is hanging 30 steps away over her front walkway, shadowing the acacia bushes. It's not fancy technology. In fact, it's something that has become invisible to most Americans. But there's a big catch. Connecting to those lines would cost her $350, with no installment plan available. There's a word for the millions of African families like Jackline's, a word coined by the research team of Ted Miguel, an economics professor at the University of California, Berkeley. Undergrid. "People talk about people being off the grid or on the grid," Miguel explains. "While the reality in many parts of Kenya, and increasingly in many other parts of sub-Saharan Africa, is that the majority of households are undergrid. They're within striking distance of the grid. They can see transformers. They could easily be connected if only there was a way to do so. But they're not connected." Miguel says that solar panels for homes are less a solution to the power problem than a symptom of a larger problem: how to get millions of Kenyans on the national grid that already powers the country's rural schools and clinics and public buildings. It's not an environmental trade-off, he argues. It isn't like the grid is "dirty" and solar is "clean." Most of Kenya's grid is powered by clean sources like hydro, geothermal and wind. And because of economies of scale, the cost of electricity on the grid is exponentially cheaper. "No industrial country," Miguel writes, "has ever powered its economic growth with solar lanterns." Miguel faults President Obama's Power Africa initiative for putting so much emphasis on mass electricity generation, and on technological off-grid solutions like home solar, and so little emphasis on helping Africans access the existing national grid. If you look at Africa's economic trajectory, he says, and say that Africa is going to continue developing and enter the ranks of middle income countries, "then you need access to electricity and to the grid. And a weakly powered home solar system or solar lantern isn't going to get you there." The question that Miguel is researching now involves how African villagers will make use of that level of electricity when they get it. It's a similar debate that America had in the 1930s around the high cost of electrifying its rural parts. That question is this: Is it worth it to a country to provide electricity to all its citizens — not just city dwellers and civic institutions? It was that question that brought me to a little dry goods store about a mile from Jackline Mumbua's house, and its proprietor, 22-year-old Joel Kitele. On Friday, 22-year-old Joel Kitele plans to take his first shower ever in a stall he built for himself. The power source: Kenya's electrical grid. Kitele's story is certainly not typical, but it shows how things could someday change. His shop happens to be within a pilot project of the Kenyan government, financed in part by the World Bank, that will subsidize the connection fee of houses and businesses in selected areas. So what has Joel Kitele done in the two months since the power came on? 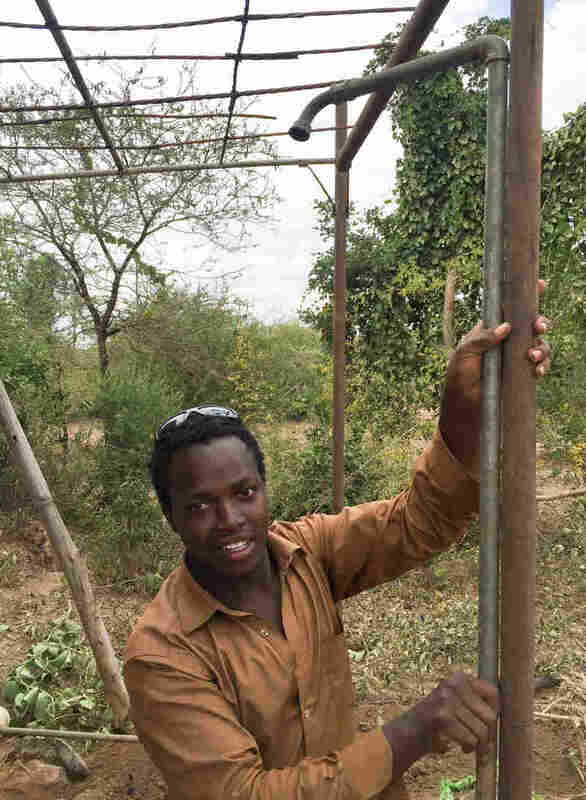 First, he and his siblings bought a welding machine to repair farm equipment. Then they started building metal chairs and tables they hope to sell to hotels. They're building kiosks in the hopes of renting them out to would-be entrepreneurs. And they're installing running water with a pump they built from scrap metal to irrigate a tree nursery they envision. 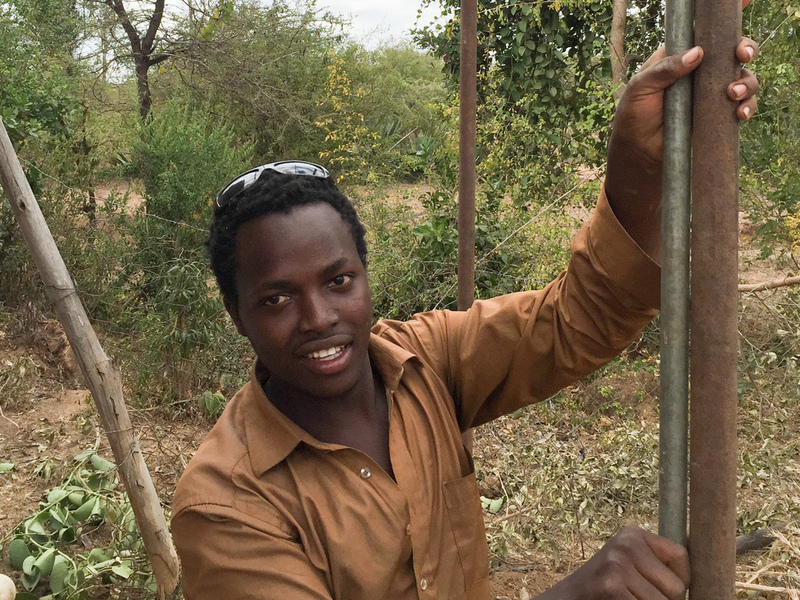 On Friday, Kitele will mark a milestone: He'll take his first shower in an outdoor stall that he and his brother built themselves. Then, he says, he'll feel urban. "At least we can say that we are part of Kenya," he says, smiling. Getting connected to the grid also makes people feel connected to the country. That's a psychological benefit that Miguel's research team has found in conducting energy surveys with hundreds of Kenyans. Solar panels, on the other hand, offer no such psychological boost. Kitele, as it turned out, had bought a panel. It now sits unused and unplugged on his roof. He's looking for a buyer. A buyer who might live 30 feet, but a world away, from power.